In 1914, Hellessen received a scholarship to study painting in Paris. I was supposed to stay a few months- I stayed twenty years. I entered the circle around Piccasso, and a new world opened up for me; from that moment, I considered myself an artist. In that year he created two Cubist portraits which already showed a mastery and an ability to enhance depth by the decomposition and multiplicity of planes. During this period of self-discovery, Hellesen seems to have been influenced most of all by Picasso and Braque. 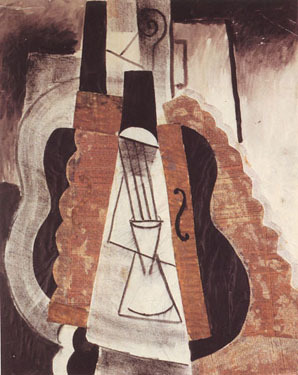 In 1915-1916, he created his collages of musical instruments, showing his understanding of the structure and form of Synthetic Cubism. During the war years in Paris, Hellesen married the artist H�lene Perdriat, who brought him into the very heart of the Cubist milieu. By the end of the war, he had become good friends with Fernand L�ger. Together they returned to Norway in 1919 to participate in an exhibition at the Tivoli Hall of Kristiania, Leger and the Modern Spirit, for which Hellesen designed the invitation. Hellesen's paintings show L�ger's strong influence during this period. In L�ger's work, the modulated grey tones showing the volume and curves of the figures set the subjects apart from the flat, brightly colored background. Hellesen combines the fundamental principles of L�ger's dynamic rhythms of contrasting line and color, yet his figures are completely assimilated into the scheme of the painting. In Personnage Allong�, the grey reclining figure blends into the background, while the vertical figure, with its contrasting color, stands out. Hellesen befriended Leonce Rosenberg, director of l'Effort moderne gallery, and a promoter of both Cubism (including Picasso, Braque, L�ger, Gleizes and Metzinger), and Puriam (Le Corbusier and Ozen fant), who included Hellesen in a traveling exhibition of French art. After 1920, Hellesen became increasingly influenced by Gleizes and his theory of painting-to animate a flat surface, to rhythmize space, to create a pure art which has no reference to exterior reality. But Hellesen never allowed his work to become simply gratuitious decoration. While Gleizes' influence is seen in the movement and rotation of planes in Hellesen's paintings, Hellesen's originality always comes through in his stunning use of color. Before 1920, his vivid colors already seemed to evoke the spirit of Gleizes' Cubism, but his murals of the 1920's are often in rich earth colors, such as ochre, black, and red. His choice evokes the feeling of medieval frescoes as well as the colorful spirit in the purism of Ozenfant and Le Corbusier. The collective desire of the avant-garde artists was to change the quality of daily life by creating an artistic environment in the streets, homes, in public life-in fact, to allow the Esprit Nouveau to penetrate the spirit of the public. In 1923, Hellesen created other murals to decorate the building of Navington at Kristiania. After a 1925 exhibition, he no longer showed his paintings, and dedicated himself to the creation of illustrations, publicity posters, and paintings to decorate public offices, salons, and stores. Hi painting Les Danseurs is one of four that were created for a ballroom in Oslo. There has been a recent rediscovery of Hellesen; in 1980-1981, two of his paintings were acquired by the National Gallery of Oslo and another was purchased by the Mus�e d'Art Moderne de la Ville in Paris.